Up to $500 rebates from CenterPoint Energy. Fast installation, long-term savings on energy bills. High performance and time-tested reliability. Throughout the Twin Cities metro area and especially in St. Paul and Minneapolis, thousands of charming older homes, built before WWII and even in recent years, use hot water boilers to provide heat. Working together with radiators and baseboard units, they provide quiet, dust-free heat to keep homeowners and their families comfortable in Minnesota’s frigid cold months. In other cases, modern homes with in-floor radiant hydronic heating systems also rely on boilers to supply the hot water required. Today, almost all boiler-based heating systems use hot water instead of steam. As the most trusted heating and air conditioning contractor in the Twin Cities, we provide a complete range of HVAC services. From supplying and installing replacement boilers to providing expert regular maintenance and repairs, our highly trained and experienced technicians are ready to respond to all service calls. Whether you need a replacement for an old boiler that is failing or costing you too much money to operate, or if you just want to upgrade for better comfort, we offer a full range of products in the entire Twin Cities metro area. 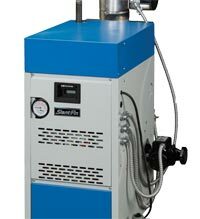 From trusted manufacturers like Slant Fin and many others, we can supply and install a new, more efficient hot water boiler quickly and at a low cost that may surprise you. Available in models to suit any application and in capacities to match the needs of homes of any size, today’s natural gas hydronic boilers can provide efficiencies up to 94% AFUE. The savings on your gas bills alone make a replacement a terrific value. In addition, we can update your heating system with new radiators, baseboard units and temperature control accessories that help you achieve maximum comfort. 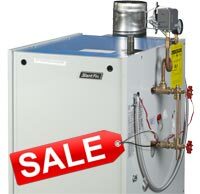 Among manufacturers of residential boiler units, Slant Fin has built an outstanding reputation for engineering, reliability, efficiency, warranty protection and performance that has made it a top choice for Minneapolis St. Paul homeowners. In their line-up of models, you’ll find an ideal replacement or upgraded model to suit any home. From low-cost standard efficiency models that save plenty over older, inefficient units, to state-of-the-art high-efficiency models that cut your energy bills to the bone, there is a system that is an ideal match for your unique home. A full range of capacities in every model makes it easy to match your exact requirements precisely. We’ll be happy to show you the complete Slant Fin line, along with boilers from other manufacturers. We’ll give you competitive price quotes and energy savings information to help you make your best choice. Equipped with advanced training and extensive experience, the skilled technicians from our heating and air conditioning company in Minneapolis are always ready to respond to your needs. For annual inspections and tune ups to fast repairs on all brands, they’re on call around the clock, every day of the year. Our service vans are equipped with the latest diagnostic equipment, stocked with commonly needed replacement parts, and can respond even on weekends and evenings. 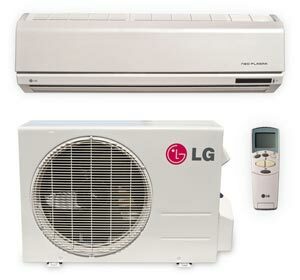 We can supply replacement parts for almost any brand and model to restore heat quickly and efficiently. Our repair and maintenance rates are highly competitive, but our training, experience and efficiency are superior. How Much Does a Replacement Boiler Cost in the Minneapolis St. Paul? Any time there’s heating outage in your home, how much it will cost to fix that problem is always a concern. If you need a replacement boiler, you’re probably worried about how much you’ll have to pay for the new installation. There’s no simple answer, since the total cost depends on the brand and model you select, its capacity, efficiency and the cost of installation. In a free, no-obligation consultation, we’ll evaluate your home and discuss a range of options that match your requirements. We’ll also help you compare energy costs for various models available from Slant Fin and other manufacturers. Since boilers are simpler in design than forced-air central HVAC systems and because installation is less complicated, you will be surprised how affordable replacing a balky, inefficient or broken boiler can be. We’ll give you the information you need, along with comprehensive, highly competitive price quotes on multiple options and let you make the decision that is right for you. As a top-rated, full-service HVAC contractor for the Minneapolis St. Paul area, we also assist homeowners with their air conditioning needs. For homes with boilers, the lack of air ducts in the home prevent cost-effective installation of central air conditioning systems. Historically, such homes have had to rely on noisy, inefficient window AC units in Minnesota’s humid hot weather. Today, however, super-efficient ductless air conditioners can provide quiet, energy saving comfort for your entire home at a low cost that will come as a pleasant surprise to most homeowners. 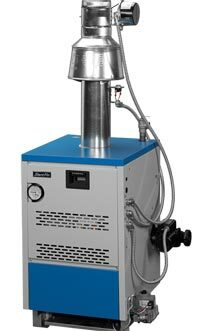 A compact outdoor compressor and condenser unit connects through unobtrusive plumbing and wiring to one or more almost silent indoor air handlers that mount on walls or floors. We’ll be happy to show you how your family can enjoy outstanding comfort in every room, all year, and at an affordable cost that fits your budget. 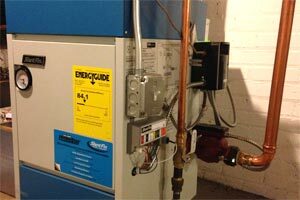 Boilers are considerably simpler than forced-air furnaces, and operate reliably and quietly, often for decades. However, in many homes, old inefficient boilers can be a drain on household budgets. 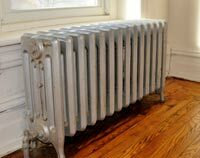 Innovative high-efficiency technology and improvements in radiators, baseboard units and other components of hydronic heating systems can provide more even heat while saving energy. Replacing older, inefficient units can result in savings that help property owners control costs and enjoy superior comfort in their homes. Additionally, ductless mini-spit air conditioning systems can now provide efficient whole house cooling without the need for air ducts or noisy, inefficient window AC units. In a free, no-obligation consultation with you, we can show you how much you can save on your energy bills, while improving your family’s comfort with an updated, modern system. For over 25 years, our Minneapolis HVAC company has built an outstanding reputation and an A+ Better Business Bureau rating by completely satisfying over 35,000 customers. If your home is heated with a hydronic boiler and radiators or in-floor radiant heating, we are your best choice for maintenance, repairs or replacement. Our experienced technical staff and consultants bring decades of experience to every customer. We offer fast, efficient service, highly competitive pricing and unmatched dedication to customer satisfaction to every customer we serve. In Minneapolis, St. Paul, and in every city and town in Hennepin, Ramsey, Anoka, Scott, Washington, Dakota, and Carver Counties, we are your local residential boiler contractor.